Because I’d like to thoughtfully contribute. My thinking also shifted. My cynicism evolved; less in certain areas, and perhaps more thoughtful in others. My faith in God and in people grew (well, some people). Unfortunately ten years of observing life around you gives you more stories of tragedy, of evil and of brokenness. Fortunately, that time awakens your heart for justice, hope and redemption as well. I’ve changed, and you have too. Then, seemingly, in these past few years, our social media culture has seen the evidence of our growing disunity and increasingly polarization of society. At least that’s what it felt like to me. The feeling of “you can’t say anything anymore without creating a firestorm” is an exaggeration that has lessened in hyperbole and sadly, grown in prudence. At some point in the summer of 2015, I wondered if I was adding to the noise, I feared I was adding hurt, and I was had this both wonder and anxiety of how to best steward this platform. Was it a place to process, was it place for action, both? Maybe – but to what degree? Not to mention the time it took to craft thoughts, and the growing responsibilities of family and ministry life, a short break felt like a great idea. I just didn’t think it would be this long. During the season of not blogging, I came to realize some of my blogger friends had also stopped putting their thoughts on blog-form. There were similar reasons, and unique ones. Some had gone through some painful situations. Some grew bored. But most felt something similar to what I was feeling. We’re not trying to go viral, or make money, we just want to add to the conversation, hopefully thoughtfully and in a way that was truly Christian. I still laugh at the one friend who told me, “Dude, blogs aren’t cool anymore …” Can I be honest and tell you that after he said that I thought to myself, “I think I might resume blogging because it’s not fashionable any more.” Doing something that is meaningful and not trendy? That’s a fairly significant piece of my pastoral calling. Here’s where I’m supposed to craft a wilderness story. I’m supposed to tell you about a time that life bottomed out, and then I had a “burning bush” experience where God told me or I heard a voice say, “Go to Facebook and tell them, ‘Free.Your.Minds.” (I did read through Exodus recently and often watch The Matrix). But I don’t have that story. This blog is not a God-send. And I’m not your Moses. Or your Morpheus. So why blog? And why now? 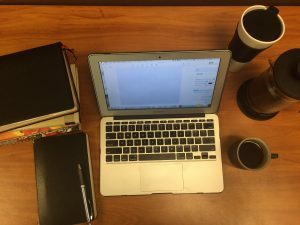 I feel compelled to blog as I see it as an extension of my personal pastoral ministry. As one who identifies with his Christian faith, I feel there is often a missing thoughtful Christian perspective that could add value to many of our meta-conversations, as in, the conversations that often connect our lives to what is going around us. I feel the Jesus narrative is often overlooked in our cultural engagement or at times poorly articulated, or characterized by others and sometimes the perceived silence is often misunderstood. Further, I feel that I’m fortunate in a lot of ways. I get to be around some really amazing people, I get access to some insightful wisdom over lunch, coffee, and beers. I get to attend some really amazing lectures, seminars, conferences and various gatherings that shape my thought-life. I’m part of an incredible church (I really am). And between family life, community life, personal reading, praying, and a heart to share, it feels time to blog again. I feel compelled to blog now because as I have been observing this past year, we have become so divisive, so polarized, and this has added to our bitterness, our anger and our confusion. Some of this is a reaction to our own hurt, and some of it is for the need for control, what we think is best for the other, for our nation, for our world, for the Church. And I know it’s all even more complicated than that. Perhaps you could consider liking the Facebook page once it’s created. Again, thanks for reading this new project – may it be of help to others and if possible, bring glory to God. It’s been the embrace of nuance that has truly served my faith, my relationships, and it’s the way I’ve been able to make sense of this broken world. It’s been a God-given gift that I’ve relied on over the years, probably decades. And these days, it’s become even more important to me now. I find it to be nearly essential in the complicated moments of life that are so highly emotionally-charged. Nuance has helped bring both: clarity to the mind and charity towards others. Seriously, I thank God for this. Words like “nuance,” “third ways,” and “gray areas” are all part of my love language. They create space for the mind between the oft-harsh polarities. They provide an avenue between the dichotomy and allow for freedom in a black and white world that demands you choose their truth or risk being dismissed as a fool, outlaw or a heretic. Well it does in the real moments between anxiety and joy, between faith and doubt and between two thoughtful options whose logical outcomes risk being in direct contradiction with each other. Nuance has been essential for me as a pastor. And it’s been essential as a husband, father, and as a person who values being in community with others. I cannot think of a time where I felt the cultural extremes to this degree and as a result, I personally have needed the nuance. Maybe you can relate. 2016 and 2017 have been many things. In addition to the presidential election, we have lived through a year of cultural tension, and great personal angst. It feels like there’s an argument behind every status update and every tweet, whether it be a trivial matter or a just cause. We are constantly being told that we’re wrong, or missing something, or operating out of a set of faulty paradigms. I learned in my twenties that the only thing harder than being right all the time is being wrong all the time. The world is filled with half-truths, sincerely mistaken or diabolically manipulative. I won’t always get it right. And likely, I won’t always get it completely wrong. I know I won’t be nuanced enough for some, and too nuanced for others. Humbly, I suggest this is because we all operate out of a sense of nuance as well. So welcome to my new blog experiment – “A Nuanced Kind of Christianity.” My hope is to finish the fall blogging and see what happens. Candidly, I have spent most of this year talking myself out of blogging, as I am concerned with being misunderstood or with misrepresenting my God, my family, my church, and the Church at large. Among other concerns, I will have little issue pulling the plug if this is a failure or if it’s just adding to the noise. But in the year of reading, praying, dialoging with others, I have often felt like I’d like to contribute thoughtfully, that I would a turn at the mic and say, “Hey, I hear what you’re saying, and I hear what you’re saying too. Maybe there’s something in the middle, maybe there’s a need for some nuance.” And Facebook status updates don’t always work for wordy people like me so given the medium of blogs, this feels like a place to start. So I’m hoping to blog faithfully, to contribute meaningfully to the conversation of faith, society and life. I find identity as a concerned pastor, as a family man, and as a Christ-follwer that really takes this stuff seriously. By this stuff, I mean the complicated journey of life that is filled with blessing and pain, joy and anxiety, injustice and God’s work of slow redemption. I’m really just trying to be faithful with it all and I suspect we have this in common, so thanks for reading, thanks for sharing the posts that resonate with you and thanks for adding to the conversation. So come friend, let us nuance together.